There’s no better way to start off a new month than with thrilling new releases, and April is going to deliver in a big way. Peruse the above list, check out all the latest issues and fresh trades, and let us know what we can save for you. We’re ready and waiting for your emails! As some of you have asked, yes, we will be open normal hours on Saturday, March 31st. 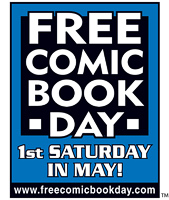 Whether you stop by then or on Wednesday for New Comic Day, we’re looking forward to seeing you again soon.